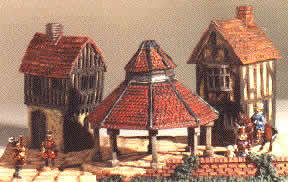 Hovels make some nice scenery pieces in several scales, though unfortunately most of the 25mm sets are too modern (17th-20thc) for our purposes. 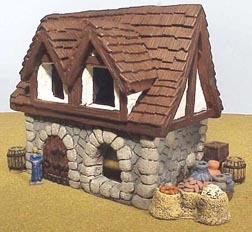 They do have some nice dwellings in the Ancients/Dark Ages range, as well as pieces for Hadrian's wall which can be used to make a fort if desired. 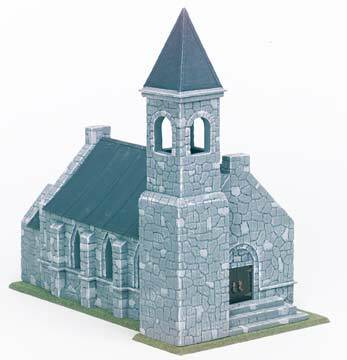 The church from the 'European' range might work for you (£11.80 unpainted), as might some of the tudor-style pieces in the 'English' range. 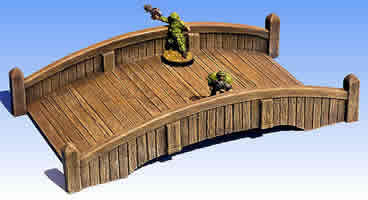 They can paint them for you too, although this is an expensive option (nearly tripling the price in most cases) so get your paintbrush out you lazy swine! 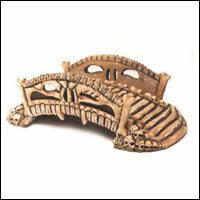 Crescent Root produce are a relatively new US terrain maker which supplies very decent resin scenery for your 28mm medievals. 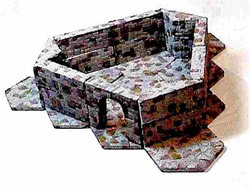 The bulkier pieces are compressed foam with a resin core. 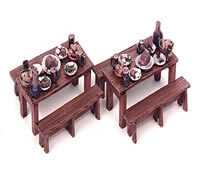 All sets are pre-painted to what looks like an unusually high standard. 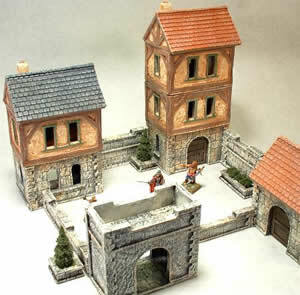 Prices are great for the quality shown (40-50 U$D for the large centre-pieces, 22 U$D for a one-story building), and the tree clusters look pretty good at the price if you don't have the skill or patience to make your own. 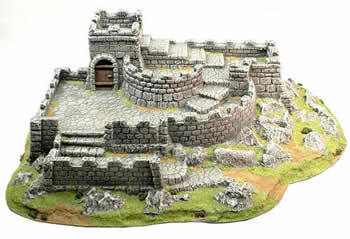 Rcreations have a wide range of 3d pieces, based on GHQ's Terrain Maker sets but for 25mm fantasy (instead of the 1/285 scale they usually favour). 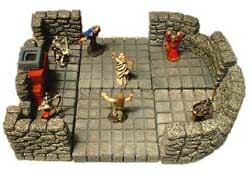 This will certainly lend a distinctive style to your tabletop, and will give your dungeons many more 30 degree turns than it would otherwise possess. 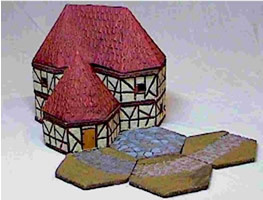 The building pieces are very stylised and unlikely to offer any useful compatibility with other lines, but they might still float your boat, especially if you already have Terrain Maker boards from your micro-armour game (well you might, I don't know), or if your army worships hexagons for some reason. 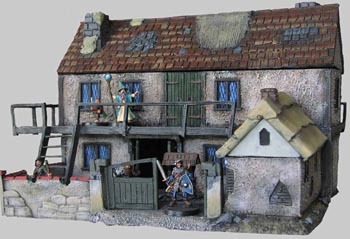 em-4 are off the mark with this pre-painted medieval-type inn. 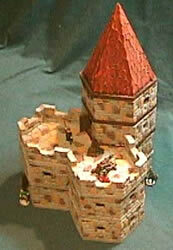 Not a bad pre-paint job, with removable roofs for placement of figures inside (the internal areas are undecorated). 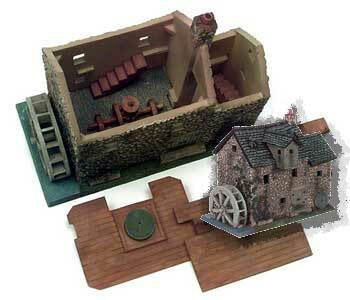 Pricing is (for a large pre-painted building) at £39 GBP plus postage. This crazy Nottingham crew have 11 (!) 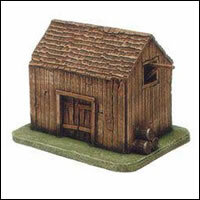 ranges of buildings for 25mm. 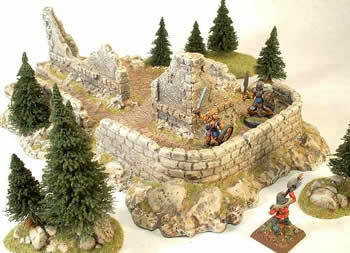 No medievals wierdly, but these are covered well elsewhere. 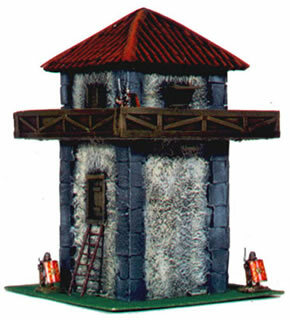 The roman watchtowers look good for border skirmishes (esp. 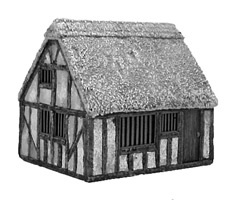 if coupled with some fortworks or Hovels' Hadrians wall), and there are nice celtic and african huts to house your barbarians and goblinoids. 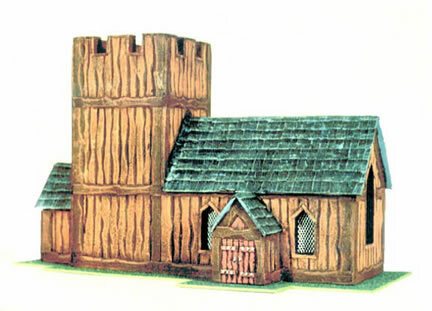 The rare wooden (saxon) church from the special editions range is a tasty item too, if it fits your theme... and there is a wooden watchtower in the dark ages range too... they should both should go up a treat when the Norse reach them! 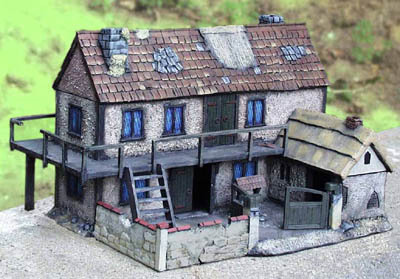 The prices reflect the fact that they are pre-painted and based and are pretty cheap for painted buildings, but many people would prefer the option, especially as there doesn't seem to have been as much artistry in the painting as in the sculpting. 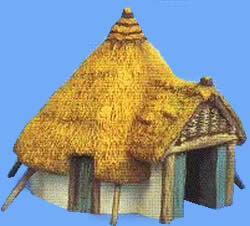 £8.25 GBP for the small african hut, up to £25 for larger buildings and £30-40 GBP for structures like watchtowers. 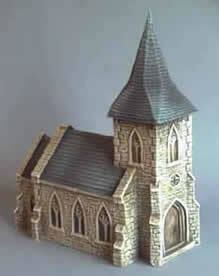 The saxon church is £44 GBP by the way. Available in the US from GamesPlus. 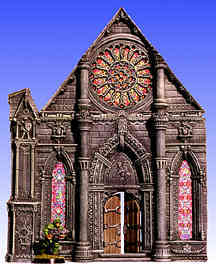 The full cathedral will set you back 120U$D, while a 3x3" building is about 13U$D and a bridge 20-40U$D. 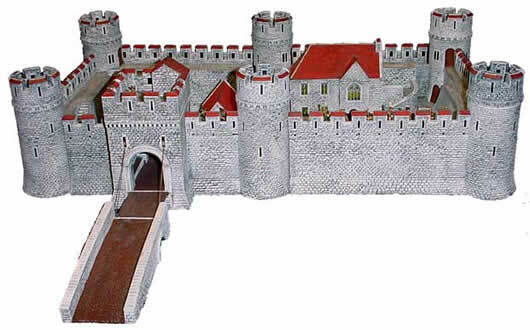 Operating out of Las Vegas Nevada, Epicast have a small section of fantasy buildings that includes another skeletal bridge and some more medieval type townhouses and towers. 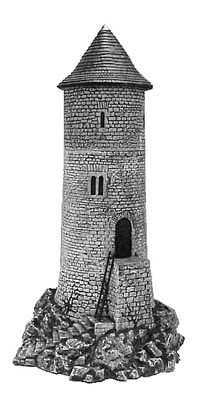 Unfortunately the pics do not have a figure for scale and no dimensions are given, so it is difficult to assess their value for money, but prices range from 20U$D for the more basic pieces to twice that for the chocolate box Wizards Tower. 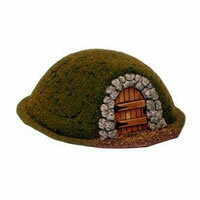 The rather strange barrow mound (10U$D) might make a nice hobbit hole! 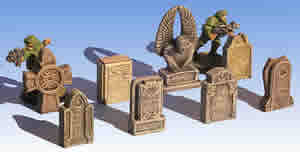 All are supplied unpainted. Based in Loveland(!) 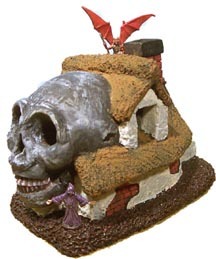 Colorado, these pieces do have a touch of the disney about them... even the skull house is unthreatening, though that could be the paintjob. They are fairly inexpensive in general so you might still be checking them out if you are in the South Western States. 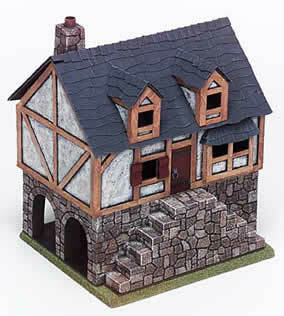 Buildings $10-$29 US. 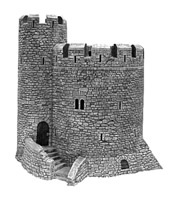 How about this beast of a castle then? 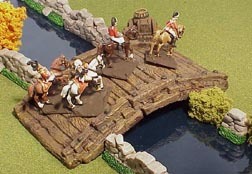 Available in a four piece set or with another two piece expansion (shown, 135 GBP) at 30" long by 16" and with damaged sections also available it should make your seige a memorable one! 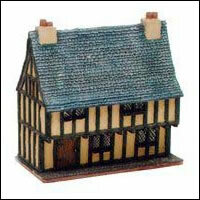 Plenty of village buildings are also available, usually in sets of 5. 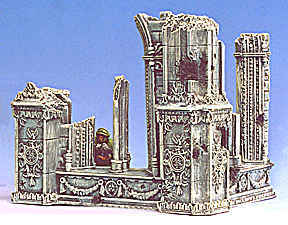 You'll need to scout about for a distributor- these images are from the Vatican Enterprises site, but they had stopped distribution at the time of writing... Old Glory might be one avenue (I could only find the castle itself at Old Glory UK, but I'm sure they could rustle you one up Stateside if you give 'em a ring). 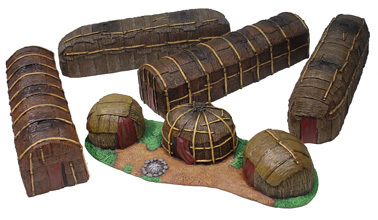 There is also a set of Native Indian tents, which might serve for an elven or goblin village, depending on your campaign background. 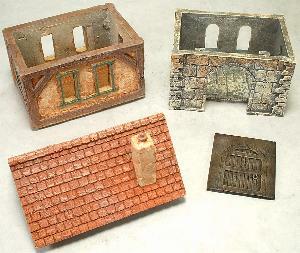 All sets are unpainted resin and are realisticallly detailed, although there are very few with removable roofs. OG (among others) also do distribution for this US company, though you can order direct from their own website for less. 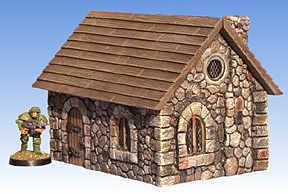 Prepainted means it won't be your cheapest option, but the pieces and paintjobs look to be of a decent standard (40-60U$D for the houses, 80U$D for the church...)- they are very large. 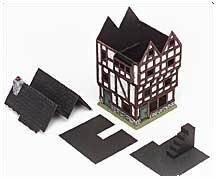 All have removable roofs- insides are painted black so if you wanted indoor atmosphere you might still have a little work to do. 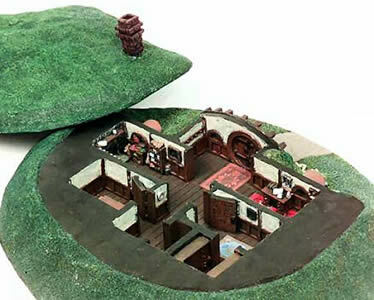 The newest offerings, like this new Halfling House (with clear literary roots) are an exception... 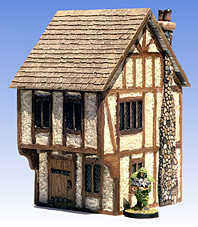 This is the beginning of a true fantasy series which, along with the 'Gold Series' buildings come with detailed interiors. One to watch I think, although at 135U$D you'll probably only be getting the one. 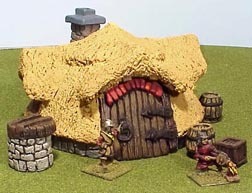 MBA are also starting to offer interior features to fill out your buildings, and 11x 17" latex sheets of flagstones or other floor materials (also pre-painted) could be very useful too (15U$D per sheet). 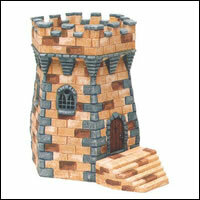 While we are on the subject, OG of course have their own range of resin buildings. 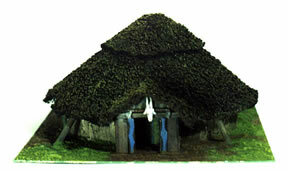 Although it is mostly later historical (WWI in particular), the African huts might be your vision of an Orc village. 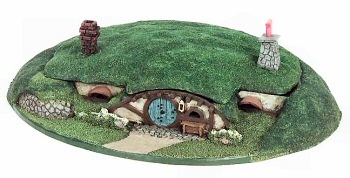 Unpainted resin, with removable roofs, though at 17.50 U$D ($10 for the simple domed huts) each you might be better with a box of pringles and some plaster of paris... or possibly a crate of coconuts.